Hillary Clinton’s lead in the polls has been declining for several weeks, and now we’re at the point where it’s not much of a lead at all. National polls show Clinton only 1 or 2 percentage points ahead of Donald Trump, on average. And the state polling situation isn’t really any better for her. On Thursday alone, polls were released showing Clinton behind in Ohio, Iowa and Colorado — and with narrow, 3-point leads in Michigan and Virginia, two states once thought to be relatively safe for her. It’s also become clearer that Clinton’s “bad weekend” — which included describing half of Trump supporters as a “basket of deplorables” on Friday, and a health scare (followed by news that she had been diagnosed with pneumonia) on Sunday — has affected the polls. Prior to the weekend, Clinton’s decline had appeared to be leveling off, with the race settling into a Clinton lead of 3 or 4 percentage points. 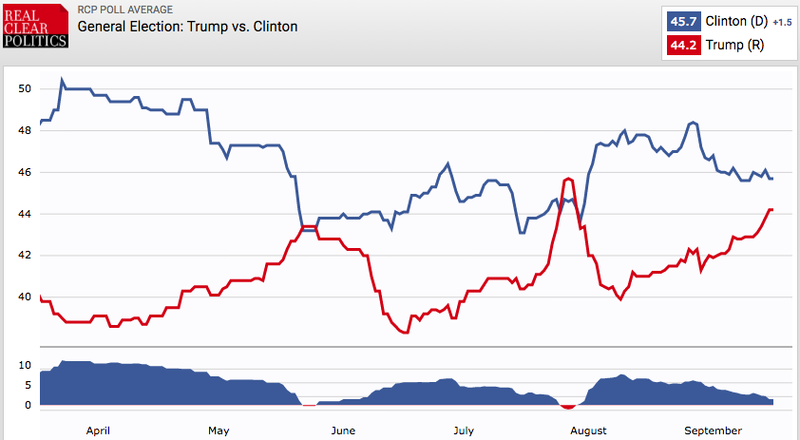 But over the past seven days, Clinton’s win probability has declined from 70 percent to 60 percent in our polls-only forecast and by a similar amount, from 68 percent to 59 percent, in our polls-plus forecast. When a candidate has a rough stretch like this in the polls, you’ll sometimes see his or her supporters pass through the various stages of grief before accepting the results, beginning with a heavy dose of “unskewing” or cherry-picking of various polls. In this case, however, the shift in the race is apparent in a large number of high-quality surveys, and doesn’t depend much on the methodology one chooses. 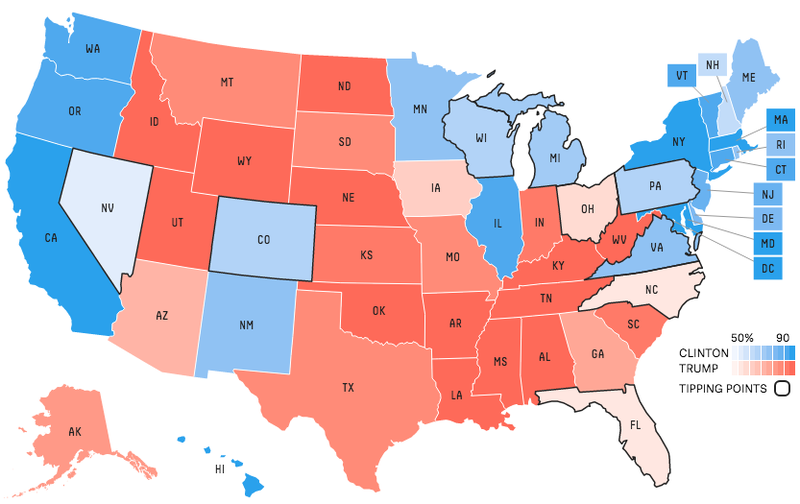 FiveThirtyEight, Real Clear Politics and Huffington Post Pollster all show similar results in their national polling averages, for example, with Clinton leading by only 1 to 3 percentage points over Trump. This potentially ignores a more important question, however. Sure, Clinton might lead by only a percentage point or two right now — with a similarly perilous advantage in the Electoral College. But is that necessarily the best prediction for how things will turn out in November? Our various models differ on this question. Polls-only assumes that there’s still a lot of uncertainty about the outcome. But it also mostly assumes1 that the current condition of the race — Clinton ahead by around 2 points — is a statistically unbiased prediction of the Nov. 8 outcome. In other words, it assumes that Clinton is as likely to continue losing ground as opposed to regaining ground from this point forward. Polls-plus, by contrast, discounts short-term shifts in the polls by hedging them with an index based on economic conditions. Even at this fairly late stage of the campaign, about 30 percent of the polls-plus forecast is based on the economic index rather than the polls. But this year, the economic index assumes the election will be very close. Thus, the recent tightening of the race is not much of a surprise to polls-plus, and it doesn’t differ much from the polls-only forecast at this point. If we had a model like this — basically, a version of polls-plus that partially reverted the current polls to the long-term mean of Clinton +5 — it would show her as about a 70 percent favorite instead of a 60 percent favorite. But would that be a good set of assumptions? Does the fact that Clinton has usually led Trump by a larger margin than she leads him now mean anything? This is a complicated question, and one that we might want to revisit over the next couple of weeks. But the short answer is… I don’t know. We know that many news events — most notably, the political conventions — produce short-term “bounces” in the polls that partly or wholly reverse themselves after a few weeks. There were also some examples of this in 2012. Mitt Romney’s position improved by several percentage points following his first debate in Denver against President Obama, but his gains soon proved fleeting. Media coverage of the campaign — which tends to rally behind whichever candidate is gaining in the polls until it tires of the story and switches to scrutinizing the frontrunner — could also contribute to such swings back and forth. So it’s plausible that Clinton’s “bad weekend” could be one of those events that has a relatively short-lived impact on the campaign. As if to put to the question to the test, Trump upended the news cycle on Friday by relitigating the conspiracy theory that Obama wasn’t born in the United States. (Trump finally acknowledged that Obama was born here, but only after falsely accusing Clinton of having started the “birther” rumors.) If voters were reacting to the halo of negative coverage surrounding Clinton rather than to the substance of reporting about Clinton’s health or her “deplorables” comments, she could regain ground as Trump endures a few tough news cycles of his own. Over the course of the general election so far, whichever candidate has been the dominant subject in the news has tended to lose ground in the polls, according to an analysis by Larry Sabato, Kyle Kondik and Geoffrey Skelley. All of this is tricky, though, because we still don’t have a great sense for where the long-term equilibrium of the race is, or even whether there’s an equilibrium at all — and we probably never will because of the unusual nature of Trump’s candidacy. Perhaps Trump isn’t that different from a “generic Republican” after all. Or perhaps (more plausibly in my view) he is a very poor candidate who costs the Republicans substantially, but that Clinton is nearly as bad a candidate and mostly offsets this effect. Still, I’d advise waiting a week or so to see whether Clinton’s current dip in the polls sticks as the news moves on from her “bad weekend” to other subjects. Listen to our emergency elections podcast on Clinton’s rough week of polls. I say “mostly” because polls-only is deliberately a little bit less confident than if it had to forecast the outcome of an election today, as our now-cast does, Still, it’s a fairly aggressive model, as you can see by comparing it against models from other news sites.